If your kids have travel sickness, it can ruin your travels. Try Kwells Kids Travel Sickness tablets. Now you can travel with confidence knowing that you have your kids travel sickness under control. Suitable for kids ages 2 years and above. Always read the label. Use only as directed. If symptoms persist see your healthcare professional. Kwells Kids travel prevention tablets should be taken 30 minutes prior to travelling. Tablets may be sucked, chewed or swallowed. Also available in Kwells For Adults! Suitable for use when travelling by boat, car, coach, plane or train. 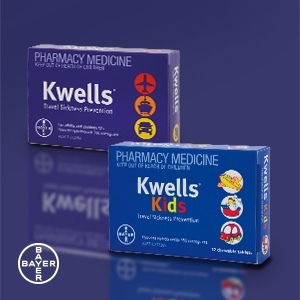 Kwells Kids Chewable Tablets is your travel sickness prevention tablets. Get your kids travel sickness under control. 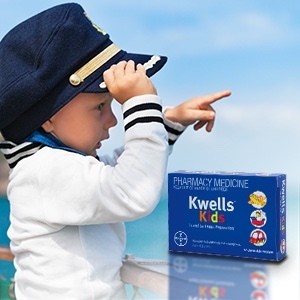 Take Kwells for the prevention of travel sickness for children 2-12 years. Take Kwells, atleast 30 minutes before travelling. - Suitable for use when travelling by boat, car, coach, plane or train. - Tablet can be sucked, chewed or swallowed. This medication may cause drowsiness and blurring of vision. If affected, do not drive a vehicle or operate machinery. Children who have been given Kwells® should not be left unattended. Each tablet contains Hyoscine hydrobromide 150mcg. CHILDREN 8 TO 12 YEARS: Take 1 to 2 tablets. Repeat every 4 to 6 hours if necessary. Do not exceed 4 tablets in 24 hours. CHILDREN 2 TO 7 YEARS: Take ½ tablet. Repeat every 4 to 6 hours if necessary. Do not exceed 2 tablets in 24 hours.